Explaining the importance of protecting your engagement ring purchase should be a mandatory requirement for every jeweler. Unfortunately, it’s not. So you must be your own advocate in protecting this valued possession. For 25 years I have stressed to my clients that insuring your ring can be a very simple part of this wonderful process, or a potentially costly oversight. As a newly engaged couple, there are a multitude of new, exciting and time consuming tasks at hand. Learning how to purchase engagement ring insurance is probably not going to be on the top of your ‘to-do’ list. However, your largest jewelry purchase of a lifetime must be protected against theft, damage, and being lost. 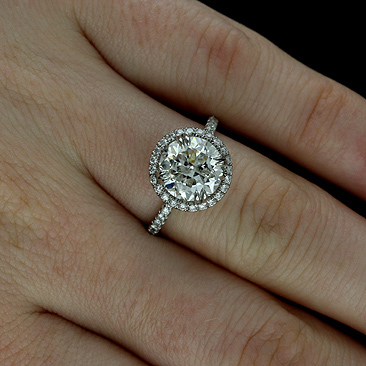 I advise the purchaser of every engagement ring that it is simple, but vital, to eliminate all risk of financial loss. The first step is to know how to properly insure your ring. The best option is through your homeowners or renters insurance. A rider can be purchased that specifically covers your ring. It is the easiest and most cost effective option, as it adds on to your existing plan at an average annual rate of 1.5% of the ring’s value. (For a $10,000 ring, that is only $150.) There should be no issue having the policy immediately approved by your insurance company. If you don’t have homeowners’ or renters’ insurance, you can take out a policy through a company that specializes in jewelry insurance. But, be cautious. Some independent firms will charge much higher premiums. My research has shown Jewelers Mutual to be a reasonable alternative, charging a 2% premium in most cases. 1. Is the ring covered if you lose it accidentally, or only if it’s stolen? The only acceptable answer is that you are fully covered for both. 2. Does the policy cover damage to the ring? It should cover all damage to the ring, and the diamond. Diamonds are the hardest substance known to man, but can chip and/or crack. The safest of all diamond cuts is the round as it does not contain pointed edges, although round diamonds can be damaged as well. 3. Will the company pay all your claims by check, or will they require you purchase a replacement through a specific jeweler? This is important, as you want the freedom to return to a jeweler you trust, or at least have the option to shop around. A jeweler with the best interests of the insurance company does not have your best interests as their priority. 4. Are there any exclusions, or circumstances where you are not covered? There should not be any exclusions. If there is: walk away. The final step is the appraisal. This will be effortless if you use a jeweler that cares about their clients and is willing to go the extra mile in protecting your purchase. All insurance companies require a replacement cost appraisal of your ring. You must always request this in order to protect the value of your ring, and to know what it is worth! A thorough appraisal will include the carat weight, cut, clarity, and color of all the diamonds, and the identification number of the accompanying gemological certificate. It will also show the type of metal such as platinum, 14kt, 18kt white or yellow gold. An honest jewelry professional will always provide a signed appraisal, on their letterhead, with all fine jewelry purchases. The appraisal serves as a guarantee of the diamond’s size and quality. Some insurance companies require a copy of the actual gemological certificate. The Gemological Institute of America (GIA) and The European Gemological Laboratory (EGL) are the two largest and the only true independent and acceptable diamond laboratories. Their reports serve as a unique, identifying ‘fingerprint’ of your diamond. Certifications from all other organizations are nearly worthless. Lastly, you should always receive a verbal or printed confirmation from your insurance company before picking up your ring. I always encourage my clients to call their agent from my store at pickup, if they have not yet done so. This eliminates all risk completely. My advice is to have your jeweler assist you if, for any reason, your policy request is rejected by your insurance company. This issue is not uncommon, and the reason will likely surprise you. Insurance companies often lose money on these types of policies, so some take steps to discourage policy holders from purchasing them. I’ve had dozens of clients tell me they were rejected for coverage. In every case, I was able to correct the issue by calling the company and demanding an explanation. In most cases, it was something as simple as the name on the appraisal did not match that on the policy due to a missing middle initial. The bottom line is to be your own advocate, if your jeweler doesn’t make the effort to help you protect this prized possession. So, enjoy every moment at this remarkable, romantic, wonderful time in your lives…everything will work out perfectly!